Note: Throwback Thursday is a day late due to extended Blogger maintenance. 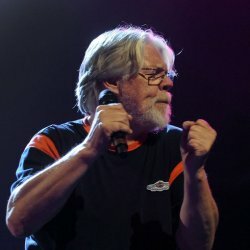 Bob Seger turned 66 this past Friday (May 6). The very next evening he sang that old time rock and roll for nearly two-and-a-half hours in front of 15,000 fans at Conseco Fieldhouse in Indianapolis. You might be thinking that most 66-year-olds would long be in bed before Seger even took the stage that night. And while that seems like an accurate statement, I saw more 60-plus-year-olds at the concert than those individuals from my own mid 20s age group. The stadium was filled with old time rockers that came out to see Bob Seger on his first tour since 2007. They didn't just come out to sit and listen either; they came out to party and have a great time. I'm here to tell you that Bob Seger and the Silver Bullet Band delivered and I found myself right in the middle of it. Now I can't claim to know a whole lot about Bob Seger's history and his contributions to music over his career. I had never owned any of the albums he has released, nor have I ever seen him perform any of his songs live or via recording. But I did make sure to get his greatest hits albums beforehand so I could sing my way through most of the concert. I have always enjoyed Seger's music in passing and I have a great interest in the classic rock era which has been passed down from my father. I was really looking forward to seeing Seger perform live alongside my dad. The show itself started off very slowly. I'm used to rock groups running on to the stage after a huge intro and go straight into a high energy rock frenzy to get things started. That is what I am used to, but that is not what happened. Just before the show started, I saw the silver haired drummer in the background thoroughly stretching out every major muscle in his upper body. I thought to myself at that point that I may end up disappointed if I didn't get to see Seger's rock energy of the '70s and '80s on the stage that night. Shortly thereafter, the 15-member Silver Bullet Band came walking on to the stage while waving at the crowd in relaxed fashion. They all took their positions with instruments in hand and started playing the intro to "Roll Me Away." They were all standing stiffly statue-esque while playing and I was still concerned for the show ahead. But then Bob grabbed the mic with both hands and started delivering that classic Seger sound. The vocals were dead on and perfectly preserved like a record from the '70s and the crowd poured in behind him singing along with every word. This classic rock experience had only just begun. As the next few songs were played, the front line of the band left their positions and started exploring the stage. Bob Seger took the mic and worked from corner to corner delivering to everyone in the crowd. His fists began pumping and his legs started stomping to the drum beat. The rest of the band loosened up as well as they were fueled by a stadium full of energetic fans. Shortly into the show, Bob strapped on a guitar and a headband to keep the sweat back while the group's energy continued to rise. The band's continuity was pretty apparent as the show progressed, and Seger later stated that a few of the guys in the band had been with him for more than 40 years. Quite impressive. The performance given that night was as expected, but what I enjoyed most about this concert was the instrumentals. The Silver Bullet Band featured so much individual talent that each of them could have been the star of the show. The lead guitarist and the lead sax guy took turns highlighting the sound of each song. The band also featured a Michigan-based quartet of horns that added a great presence to the stage. Additionally, the backup singers in the band not only provided their vocal talent, they also played just about any percussion instrument you could imagine. And let's not forget about the piano play that really pulled everything together as it helped set the pace. To hear all those instruments coming together behind the legendary and unique voice of Bob Seger really made this concert stand out above most I've seen. Throughout the duration of the show, the band played nearly every song you would expect to hear. They even added a new song that will be coming out on the next album, as well as several songs that were a part of some of his earlier releases. To me though, the song that highlighted the evening was a song that I hadn't heard of before titled "Horizontal Bop." The band had the whole stadium dancing during the song, as many of them went in to the aisle ways to really get moving. There was even a man that appeared to be pushing 80 that began dancing with a woman half his age. A couple of beach balls also appeared out of the middle of the crowd and at this point, the security crew really had their hands full. Let's not forget, these people were predominantly at retirement age! You always hear the expression that "Rock and Roll Never Dies," but this show really put that statement into perspective for me. By the time the concert came to a close, Bob Seger's hair was completely saturated and some lucky person in the crowd got to go home with that headband. The group had played for nearly two hours and 20 minutes, including not just one, but two encores. As I walked out of Conseco Fieldhouse, all my family was talking about was the performance and what my parents remembered about Bob Seger and his music while growing up. It was a great experience to go to the show with my parents and get to relive their memories from younger days along with the music that influenced some of those memories. We drove home to listening to Bob Seger on my iPod all the way back. Hats off to Bob Seger and the Silver Bullet Band for putting on a great show. It was a great experience to hear those classic rock songs performed live as they were when they originally came out decades ago. I hope you have enjoyed my perspective of a show featuring music that came well before my time. I cannot write with much expertise on Bob Seger's musical era, but I sure enjoyed that Old Time Rock and Roll. I may not have any records to take off the shelf, but Bob Seger's Greatest Hits will have a home on my iPod for quite some time. Article first published as Concert Review: Bob Seger Rocks Indianapolis, Indiana, 5/7/11 on Blogcritics.